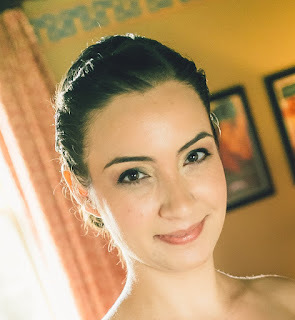 Amy DuBoff is a speculative fiction author and the creator of the Cadicle series. She stopped by the blog to chat about her work – with the latest in the series, volume five, publishing today. Hi Amy, and welcome to the blog, and congratulations on the new book. How are you feeling about the launch right now? Nervous or in the hey, I've done all this before stage and feeling relaxed? Hi! Thanks for having me over to chat with you. I have to say, the nerves aren’t too bad this time around. With four previous books, I’ve had an opportunity to refine my book finalization and launch process so it definitely went smoother this time. I’m really pleased with how the book turned out, so I’m mostly just excited to see some reviews come in. I hope readers enjoy the story! The Cadicle series runs to seven books – of which this new volume is the fifth - was it always envisioned to be that the series would run to that length when you started out? Oh, goodness no! 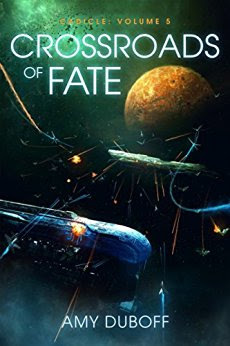 When I first started scoping out the story, I planned on it being a two-part novel: Part 1 with Wil as a teenager (what is essentially now Volume 2, “Veil of Reality”) and Part 2 being the war (what is now Volume 5, “Crossroads of Fate”). That notion got tossed out pretty quickly, and it evolved into a trilogy. Once I started writing, I realized that wasn’t going to work, either, so Book 1 of the trilogy became Cadicle Volumes 1, 2, and 3, Book 2 became Volumes 3 and 4, and Book 3 became Volumes 6 and 7. Even with those significant augmentations, there are still some time gaps that readers have asked me about. So, I’ll likely add some little novellas later on to bridge some of those timespans, but I want to release the core seven volumes first. Setting up a whole grand series is ambitious from starting out – but this has been brewing for years, I understand. How long has this saga been running around your head – can you remember what kickstarted it? I first starting writing the series when I was eleven years old (so, almost nineteen years ago), but the early concepts were forming for a year or two before that. I’m a little ashamed to admit this, but the very, very, very early seeds of the series evolved out of my profound dissatisfaction over the end of the 1990s TV show “Sliders”. I always thought that Quinn and Wade should have ended up together, and that’s where the characters of Cris and Kate started. What is now the Tararian Select Service (TSS) began as the Dimensional Secret Service (DSS), and the Bakzen were initially inspired by the Kromaggs… Yeah, I was a pre-teen. Anyway, those early concepts changed over the years as I was exposed to other things. “Ender’s Game” and “Dune” were big influences, and “The Matrix” definitely influenced the aesthetic of the TSS Agent uniform. The TSS command structure was somewhat inspired by the Aes Sedai from “The Wheel of Time”, though it could be argued that everything traces back to the Bene Gesserit. It’s difficult to say where the telekinetic abilities in my series came from—it was probably early exposure to “Star Wars”, but honestly, I just think telekinesis is awesome. Ahhh, Quinn and Wade, unrequited love! The opening of book one – which is free on Amazon, if I remember rightly – very much reminded me of Dune, with Paul Atreides getting his training early on ahead of the perils he would later face. Was that kind of grand space epic in your thinking when you came to creating Cadicle? Yes! The opening to “Architects of Destiny” is an intentional homage to that scene between Paul and Gurney. I wanted to set that “classic Golden Age” sci-fi tone right from the start. 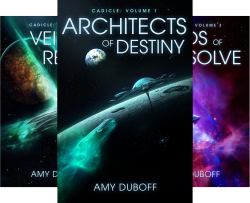 The Cadicle series is straight-up galactic empire space opera, so I wanted readers to expect character-driven story with touches of political intrigue, space battles, and romance right from the get-go. Your lead character is Cris Sietinen – tell us a little about him and his evolution in bringing him to life for your story. Cris was born into an affluent life where everything was handed to him. In many ways, he’s completely spoiled. Except, money and education are no substitute for a loving, accepting family. Cris had an older brother who died before he was born, which devastated his parents. As a result, Cris grew up feeling like an unwanted replacement heir to the family legacy, so he found himself looking beyond the familial norm of a life in the Dynasty’s navigation company. Cris recognizes he will never be able to pursue his innate telekinetic abilities on Tararia, so he decides to set out on his own to find an instructor, with the chance to join the TSS being the real prize. What Cris doesn’t realize at the time he leaves home is that he is the penultimate result of a generations-long plan orchestrated by the Priesthood, a quasi-governmental agency overseeing affairs for the Taran empire. When Cris does join the TSS, it’s just the beginning of his role in a much bigger conflict that will ultimately change the course of Taran civilization. Since this story spans multiple generations, Cris is sixteen at the beginning of the Cadicle series, but he’s middle-age for most of it. Though it’s not all detailed in the books, Cris is shaped by his life experiences. He’s somewhat volatile and self-centered in Volume 1, but he matures into a level-headed leader with an understanding of his unique place as both a dynastic heir and a high-ranking TSS official. As a father himself, he has the opportunity to provide the love and support he never received as an adolescent. Exploring those interwoven dynamics of father, politician, and military leader has been a fun challenge for me. The story itself spans many years over the different books – is there a central theme that binds them together, what is at the core of the tale for you? There are two main themes carried throughout the books. The first is the importance of interpersonal bonds—that even when faced with great adversity, a committed team can accomplish much more than the sum of its parts. The second theme is the balance of duty and morality—knowing what must be done, but not agreeing with the driving forces or the methods of carrying out the task at hand. Both of these themes have deep-rooted psychological implications. I wanted to not just tell a typical military sci-fi tale full of space battles, but rather delve into the emotional impacts of those experiences and how the pressure of leadership can change a person’s outlook. The central conflicts are not clearly defined good versus evil, but rather dabble in the shades of gray in between. Now the new book leads us straight into full-on war in the universe – is this where the gloves come off? What should readers expect? I colloquially refer to this as the “battle book”, haha! This book is definitely where everything gets laid on the line on both sides—TSS versus Bakzen, with nothing held back. But, in many ways, it’s also Wil versus Tek pitted against each other in a much more personal conflict that’s been brewing for a decade. Readers can expect some large-scale space battles, weaponized telekinesis, and an exploration of the darker side of war. This book will resolve the conflict with the Bakzen that’s been building for the past four volumes, but there’s still much more of the story left to tell. You've published the series at quite a rate – book two, for example, was June last year and here we are at book five. How do you approach writing the books – do you set the deadline dates and work to reach them or write the book then pick the date? I do try to set deadlines for myself. It’s been thrilling to have readers write me asking when the next book is coming out, so that’s been a great motivational factor. I have typically thrown out a general timeframe for each of the recent releases (such as Q3 2016 for Volume 5), and once I have about 85% of a first draft done, I’ll get a target date. I don’t lock in the date until I get my first round of beta reader feedback, though, just in case I need to do some major reworking. I want to make sure I release a polished final product, so I am sure to leave ample time for proper editing and proofreading. Is there a particular habit or discipline that you've established for your writing process? How does your writing day shape up? The books have been very well received so far – lots of reviews I see on Amazon! How do you find the marketing process and, if you've got one tip that you would pass on to yourself from a few years ago, what would it be? The biggest thing I would have done differently is had more books ready to go before I published the first. (1) I feel like my writing has gotten better with each book, and (2) it’s difficult to maintain momentum in the market when only releasing one book every four to six months. I probably would have had the first four ready to go rather than only the first two, and also would have told myself to not worry about marketing until the third book was out. Marketing one standalone title is difficult because there’s no follow-up action for readers if they like your work. Have patience, send out lots of review copies of the first two books, and then do heave promotion of Book 1 to correspond with the Book 3 release. I’ve learned a lot in the past year and a half, and I think I’ll be able to approach my next series in a more organized fashion. In the interim, I’m thrilled to have readers enjoying this little pet project of mine! Outside of the Cadicle series, do you have any writing in progress or published? In terms of completed projects, I recently had a short story published in the “Crisis and Conflicts” anthology by NewCon Press, which was released in July. My next project will be sort of in the LitRPG vein with a space fantasy theme. Expect more about that in 2017 :-D.
I understand you're quite the fan of strategy board games – a love I share, I hasten to add, though I've still to find time to quite finish the full game of Empires In Arms, Avalon Hill's majestic Napoleonic wars game! What are your strategy games of choice? Being a space opera writer, I have a soft spot for Twilight Imperium. I’m also a big fan of Arkham Horror and Shadows Over Camelot. For less “we’re going to play one game for the next five to ten hours” get-togethers with friends, I like the deckbuilding games Dominion and Ascension. And, for those times where it’s really not about strategy, I must admit to being a horrible person… because Cards Against Humanity does make for a great party game with the right group. By day, you work in marketing for an engineering and architecture firm – how do you find the juggling of different roles to accommodate writing? It’s a challenge. I am lucky to have a very supportive husband who understands when I tell him I’m going into “headphone land” and can’t talk for the next three hours. I’ll set aside some weekends for productive writing time, but otherwise I just try to fit in little bits here and there when I can. The great thing about self-publishing is that I’m my own boss, so I can adjust timelines for releases and promotions to fit within the other things going on in my life. In terms of your influences, classic science fiction obviously leaps to mind, but who would you say are your touchstones – and is there one in particular? If so, why that one? “Dune” is probably the single greatest influence, if I had to pick one. The balance of politics, technology, culture, and underlying social commentary is on a writing level I can only aspire to one day achieve myself. However, I take a little something from everything I read and watch. I have the core plot points set, but by this point the story has a life of its own. If I get an idea for a cool new twist or piece of technology, I’ll try to find a way to make it work within the established framework. In terms of writing style, some readers have compared me to Heinlein (which is very flattering!). I think that’s fitting in many ways, because most of my work is Young Adult friendly, but I try to have an underlying message—something I feel all good sci-fi should have. I want to entertain my readers, but I’d also like them to pause and think. Are the books available in other formats – audio, for example? Yes! Right now, you can get all of the books in paperback as well as ebook. Podium Publishing has acquired the audiobook rights to the Cadicle series, but I don’t have a release date yet. I anticipate the first audiobooks being available later this year or early in 2017. Best of luck with the launch, and we always end with a double question here – what are you reading at the moment and what is your favourite book that you've read in the past year? While I’m not actively reading anything at the moment, I just recently finished reviewing an ARC of “Children of the Void” by Jack Halls. I recommend it! Beyond that, I honestly haven’t had much time for reading over the past year due to my writing and work schedule. However, I did start the Twenty-Sided Sorceress series by Annie Bellet a few months ago and am very much enjoying the ride. I hope to a lot more reading in 2017! Many thanks, Amy, and thanks for visiting Altered Instinct! The latest book in the Cadicle series, Crossroads of Fate, launches on Amazon today - you can get it here. You can find Amy on Twitter here, and find out more about her work on her website, www.amyduboff.com.